Raveena Tandon took a flight from the muted-toned outfits and instead surprised us with a quirky number. It was an Anamika Khanna number- the designer, who recently won the Designer of the Year at the Vogue Women Of The Year 2018 awards. 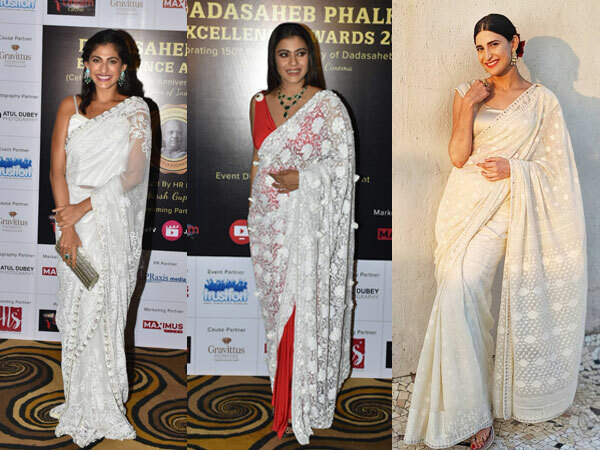 Raveena's ensemble was dramatic and eye-catching for sure but this we thought was a bit disappointing look. The prolific actress wore this attire for the Asia Spa Awards, where she was honoured. It was a vibrant outfit that consisted of a long cape and pants. Her attire was full-sleeved with bell sleeves and was accentuated by colourful tassels. The pants were straight-fit and matched with the theme of the cape. Raveena's outfit came alive with myriad prints of women, birds, flowers, and more. We loved the interplay of prints, which made her attire worth every stare. She paired her ensemble with pencil heels. Her oxidised earrings came from the label My Motifs and the complementing rings were from Minerali. The makeup was dewy and highlighted by smoky eyes and matte lip shade. The impeccable high bun rounded off her look, which we felt didn't add to her look. Well, Raveena is mostly dressed to perfection but this time, we felt she looked a little uncomfortable. Hope Raveena makes a strong comeback and inspires us fashionably again.